Dan Murrell, Senior Vice President and seated Mr. Robert Jones, Chairman and CEO. Triple J Enterprises started operation as a small auto dealership in 1984 when Robert H. Jones signed an agreement with his oldest brother, the late Kenneth T. Jones, Jr. to buy the Subaru franchise. Robert Jones had by that time worked for 24 years with Jones & Guerrero Inc., the company founded by his brother. 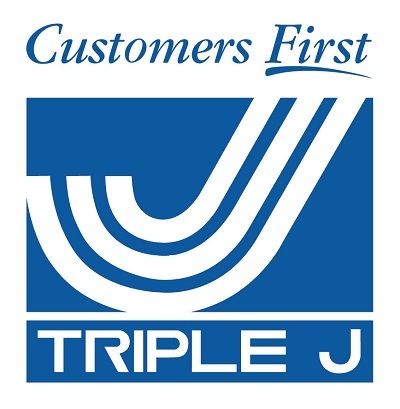 The genesis of the Triple J Enterprises name came from the first initials of Robert and Margaret Jones’ offsprings –– Jeff, Julie and Jay. When the company was first formed, Robert Jones sought the help of his oldest sister, Georgia Jones Stafford who provided some financial assistance and role as a buyer. Margaret Jones also played several contributing roles in the early years of the corporation as a buyer, advertising and public relations manager and company treasurer, a position she still retains to today. In the beginning, Georgia Stafford was worried about her brother spreading himself too thin. But her concern was replaced with admiration and confidence as the small startup enterprise which began with Subaru vehicles, Hino trucks and Bluebird buses, soon grew very rapidly to become one of the most successful corporations in Guam, CNMI and Micronesia. Triple J Saipan Inc. was formed in 1985, followed by the acquisition of a freight forwarding operation, Mighal International doing business as Triple J Merchant Services in Oakland, California, and soon after, formation of Triple J Wholesale Foods in the Marshall Islands and Saipan. By its 20th year in 2004, Triple J Enterprises’ diverse portfolio included wholesale food distribution businesses in Guam, Saipan and the Marshall Islands; new distributorships of vehicle brands namely Isuzu, Mitsubishi, Suzuki; the Ford and Mazda dealerships; after-market tire, lubricants, commercial truck and bus tire businesses; real estate development and land brokerage business; and the start of its restaurant division with the purchase of the Outback Steakhouse franchise. The group’s earnings had reached close to $90 million in 2004. In that same year, the company broke ground on its 50,000-square foot, $11 million new corporate head office and Triple J Motors main showroom and full service center. In the recent past 10 years, Triple J Enterprises was appointed official distributor of Kia Motors for Guam and Micronesia; added Honda and Acura brands to its car distribution business; opened its new corporate and main showroom building in front of Kmart in 2006 as well as the new Honda and Acura showroom in Tamuning; and acquired franchise rights for the Hertz Rent-A-Car brand in Micronesia. Solahart, a leading brand in hot water systems, was added to the Triple J Enterprises’ long list of distributorships in 2007. In its restaurant group, the company holds the franchise for Capricciosa and Tony Roma’s in Saipan as well as equity in Truong’s Vietnamese restaurants both on Guam and Saipan. Triple J’s real estate division is a full-service brokerage house specializing in development, property management, commercial sales, leasing and residential sales. The real estate group assets include properties in Guam, Saipan, Majuro, Pohnpei, North Carolina and Japan.